Sobering. Disturbing. A Wake-Up call. Andrew Breitbart's last gift to America is an expose of the new American Left. It is chilling. 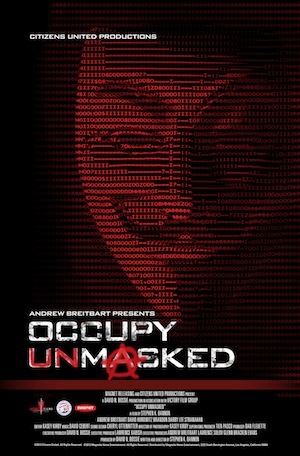 In the movie Occupy Unmasked Andrew Breitbart and his team walks movie goers through the evolution of the hippy dippy war protesting left of the 1960's to todays new face of anarchy in America in 2012. No surprise here, the same old dirty hippies and anarchist of the 1960's are here to co-opt the minds of America's youth. Billy Ayers, Code Pink, The New Black Panther Party, Wade Rathke the SEIU, envirofascist with the help of Presstitutes of America's Main Stream Media, which we can now call 'AmeriPravda'. Brietbart and his team show how a small number of clueless college students idea for a protest was used by the left to counter a truly homogeneous movement of Tea Parties across America. This is not an easy movie to watch, as a Patriot everything you love about America is assaulted. And it is this reason "Occupy Unmasked" is important film you must see. The mainstream media (many of whom not only support but actively promote the left) falsely presented this amalgamation of anarchist activist of the left as average American youth who spontaneously took to our cities in massive sit ins because they could not find jobs in this economy as a natural outgrowth of the selfishness of Capitalism, and corporate wealth. Occupy Unmasked completely dismantles this narrative. You can find Occupy Unmasked theater location and ticketing information here. On Facebook you can support Occupy Unmasked here. The "Change" Obama and the left believes in and wants as reality in America and all of it's ugliness is on display in Occupy Unmasked. My husband found this film more important than 2016: The Movie, because as he stated, "while most Americans have delved into trying to sort out who Obama is, they have no idea who is behind this movement the Left, Democrats and the President claimed to be spontaneous." I agree, Occupy Wall Street is the monster child of Marxist, Anarchist, and all of those who hate the freedom our nation represents. Occupy Unmasked is a MUST SEE film, if it is not showing in your area buy the DVD. Just because the OWS America hating mobs are not camped out in our cities does not mean they are not busy filling the incubator of hatred with our youth. I give Occupy Unmasked five Perfect Umbrellas Up!